Houston has experienced success maintaining a viable urban core largely due to its ability to diversify its economy from relying solely on energy. Another major factor is its ability to annex its surrounding suburbs keeping its tax base wealthy and slowing middle class flight which prevented the rapid decay of the cities core. The Houston area geography is often characterized and referenced according to its freeways. The I-610 loop is its “inner loop” and the Beltway can be described as its “outer loop”. Most of pre WWII Houston existed within what is now the 610 loop. Suburbs began to spring up outside the loop and after the civil rights era much of the area inside the loop was being abandoned by both Black and White working and middle class residents looking to move further out. These sprawling moving patterns prompted the construction of the Beltway. African Americans in Houston are in search of new places to live at higher rates than the metropolitan area as a whole. 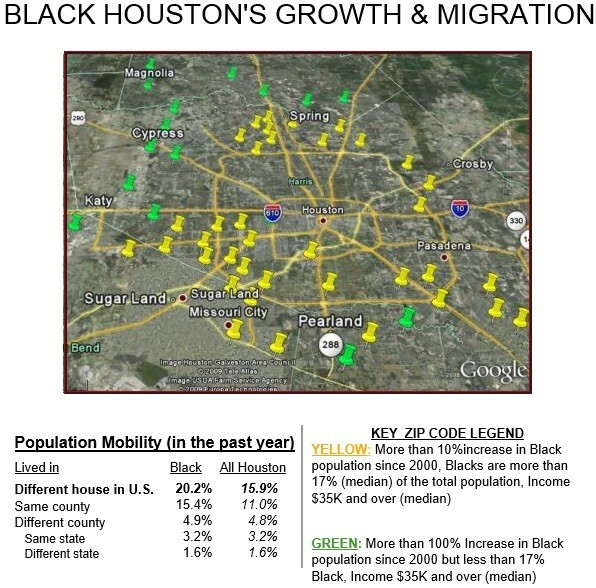 Twenty three percent of African Americans in Houston moved from 2006 to 2007. Seventy one percent came from a different county, meaning they either relocated from outside the Houston area or left Harris County for the surrounding Fort Bend, Brazoria and Montgomery counties.